Hi there, my darlings! Happy Thursday! One more day til Friday and the weekend, baby! And weekends for me are all about the sleep-ins and pampering. Today, I'll show you just the thing for a bit of weekend TLC...for your hair! 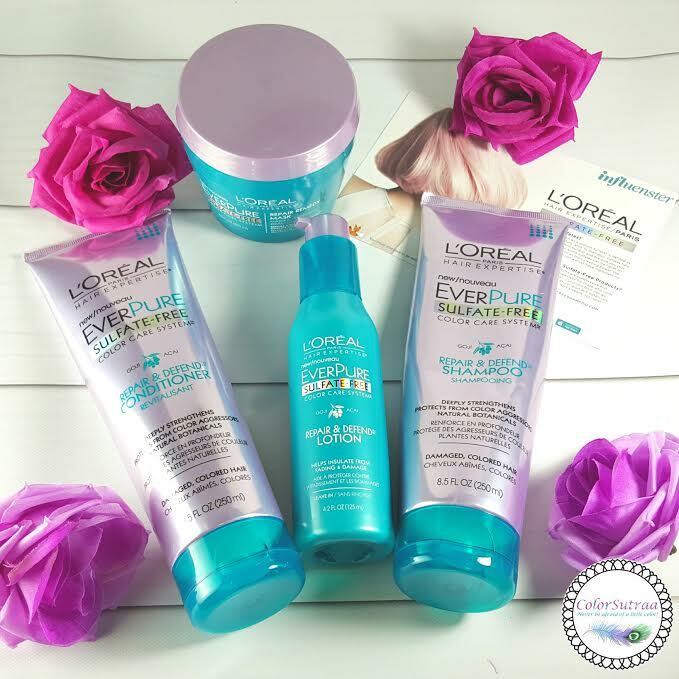 Recently, I was chosen by Influenster to receive their L’Oréal Everpure hair collection. I'm always looking for new products to my haircare routine and since L’Oréal is one of my favorite brands ever, I was doubly excited! They send out products in what they've coined their Voxboxes--members of the Influenster community are invited to surveys and, based on their preferences, are sent various products to review. 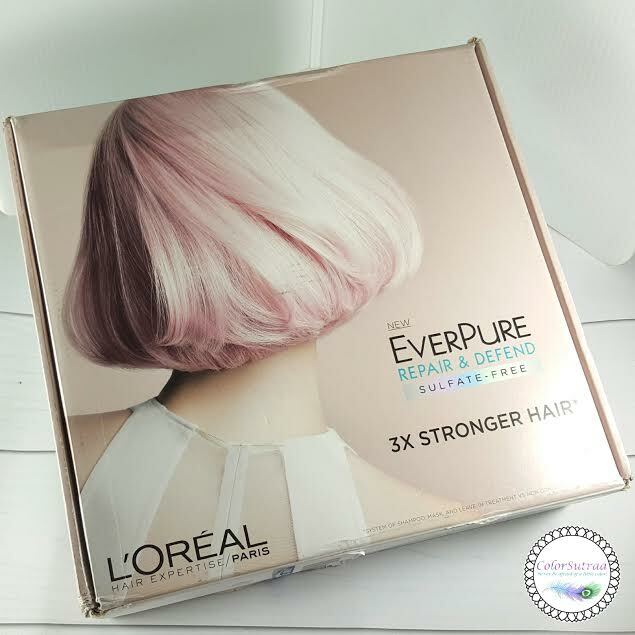 I'm especially happy when I get to review the beauty-related VoxBoxes, like this one with the entire new Everpure collection for Color Treated hair from L’Oréal! Hair Expertise: EverPure Repair & Defend™ Shampoo ($6.99) : EverPure Repair & Defend™ is our first sulfate-free color-care system for damaged, color-treated hair. Formulated with our exclusive Antioxidant Complex – Acai, Goji and a UV filter – our system helps repair damaged hair while protecting from daily color aggressors. Hair is stronger, more resistant and helps color stay pure wash after wash. No Sulfates. No Parabens. No Harsh Salts. Hair Expertise: EverPure Repair & Defend™ Conditioner ($6.99): EverPure Repair & Defend™ is our first sulfate-free color-care system for damaged, color-treated hair. Formulated with our exclusive Antioxidant Complex – Acai, Goji and a UV filter – our system helps repair damaged hair while protecting from daily color aggressors. Hair is stronger, more resistant and helps color stay pure wash after wash. No Sulfates. No Parabens. No Harsh Salts. While I'm a huge fan of L’Oréal as a brand and whenever I color my hair at home, whether it's a quick, all-ver color change or for touchups, L’Oréal is my go-to. That being said, I can't believe I've never really tried any of their shampoo and conditioners! I mean, I always save the conditioner that comes with the box when I color my hair and I've loved that but I've never tried their shampoos! Because I really like this one! It lathers so well and I love how clean my hair and scalp felt, even while in the shower.The conditioner is rich and quite luxurious and left my hair feeling oh-so-soft after each use. I went ahead and did my usual air-dry test and my hair felt so soft and thick in the morning, with just a little brushing. Best part? I definitely saw much less frizz, with even my flyaways behaving, despite the fact that NYC has been having some awfully humid weather lately. The only con and it's not even that : I'm unsure how I feel about the scent. It's fruity but not very sweet, with an earthier, muskier undertone. Almost a tad spicy. For a girl who loves florals and sweet fruity fragrances, this took a bit of getting used to! 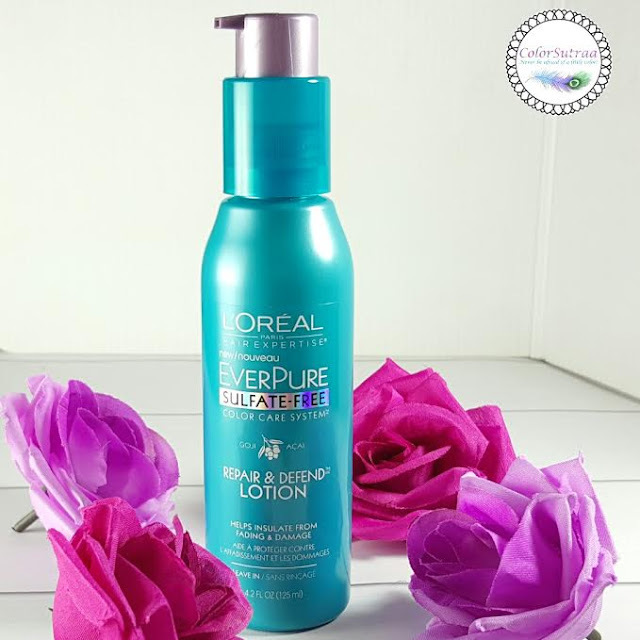 Hair Expertise: EverPure Repair & Defend™ Lotion : EverPure Repair & Defend™ Lotion is our first sulfate-free, leave-in treatment that together with the EverPure Repair & Defend System* helps defend hair from external damages for vibrant color. Applied daily, it moisturizes, revives shine, and fortifies hair sensitized by UV rays, water and heat styling. 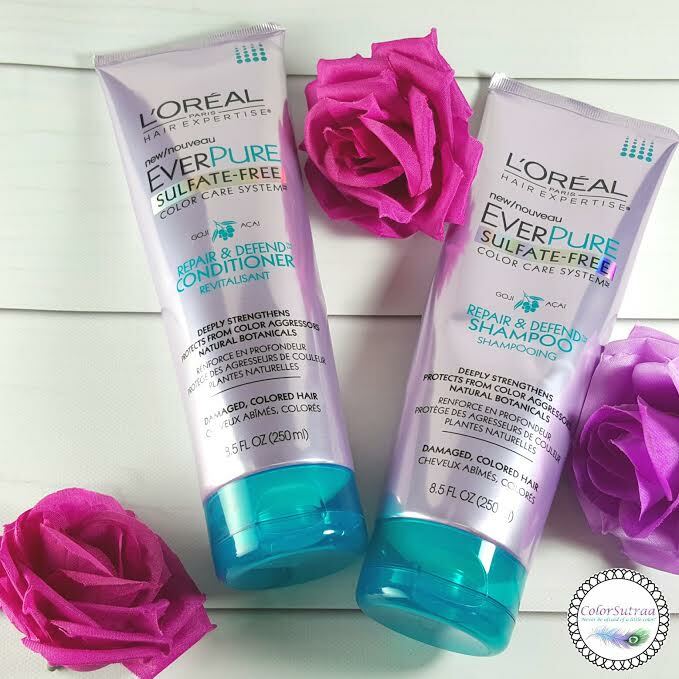 Directions : After using EverPure Repair & Defend Shampoo and Conditioner, apply 1-2 pumps evenly through damp hair. Style as usual. Similarly scented as the Shampoo and Conditioner, this leave-in treatment is actually quite sticky when first applied to damp hair. Since I intended to air-dry my hair, that immediately concerned me. But, I'm happy to report, my fears were unfounded! I woke up this morning with smooth, shiny, gorgeous hair that wasn't at all sticky or tacky! Yay! 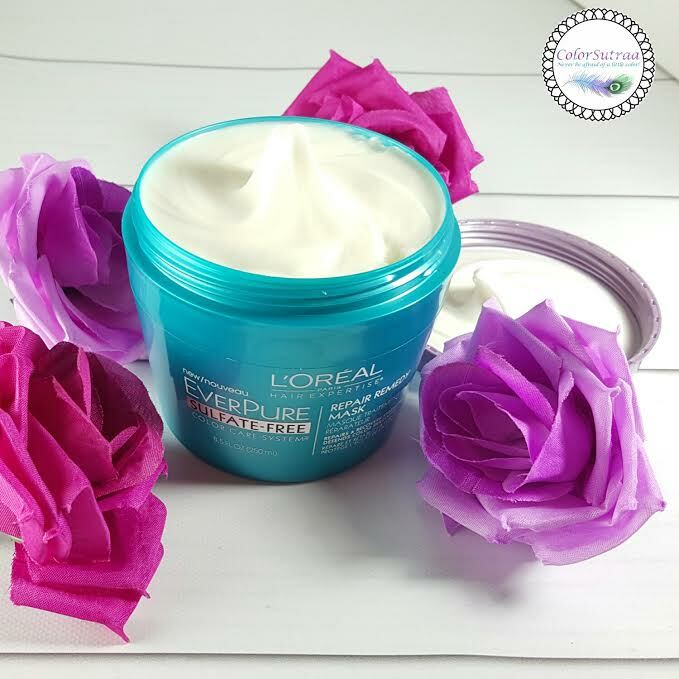 Hair Expertise: EverPure Repair & Defend™ Mask ($8.99) : EverPure Repair & Defend™ is our first sulfate-free color-care system for damaged, color-treated hair. Infused with Acai, Goji and a UV Filter, the Antioxidant Complex repairs and strengthens hair while helping keep color pure. Remedy Mask is a restorative hair mask treatment for highly damaged, weakened hair. Our exclusive formula with Antioxidant Complex deeply penetrates to help repair, strengthen and polish every strand. After using EverPure Repair & Defend™ Shampoo and Conditioner, massage into damp hair from roots to ends. Leave on for 3-5 minutes. Rinse. Use twice a week or as needed. Now, I'll admit that I haven't had a chance to use this yet but I'm loving the look of this mask! So rich and lush! I HAVE used hair masks from L’Oréal before and if those are any indication, I'm pretty sure I'm going to love this one too. Definitely on my to-do list for this weekend! The scent? Same as the products above--I guess I just have to get over that. If you're not part of Influenster yet, don't wait--sign up HERE! Their VoxBoxes, if you're lucky enough to get chosen for one, are always amazing! Ohhh I really want to check out that mask! I think it's great that it has UV filters. I need that even though I'm not out in the sun often. I've been testing these out too! I haven't tried many L'Oreal hair products, but this range does sound pretty great. Especially with UV filters, bonus! Ooh, I want to try these! My hair is so dry from bleaching it blonde, so I'm always looking for good color-safe haircare. I love the L'Oreal pro masks for the hair. These sound lovely! I need to try this shampoo and conditioner. As a colour treated head, I am always searching for the gentlest and most moisturizing products I can get. It is so wonderful that the mask includes UV filters! More haircare products really should! Sounds like good stuff. I had some shampoos from them before that were great. I have heard some good things about this line and I think the Masks are definitely great.